After four years of study in chemistry and Spanish, immersing herself in lab research and volunteering with Syracuse University Ambulance, among other accomplishments, there’s one final thing that Jaime Bernstein ’13 says has made her time at Syracuse University feel complete. 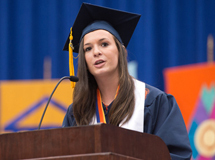 The Fairfield, Conn., native was named one of 12 University Scholars and was selected by her fellow University Scholars to give the student speech at Commencement, representing all the scholars. Watch and read Bernstein’s speech here. University Scholars, the highest undergraduate academic honor bestowed at the University, represent the entire graduating class. They are designated by the SU Scholars Selection Committee, which selects the students based on academic achievement, creative work, a personal statement and a faculty letter of recommendation. Bernstein came to SU with an interest in science and medicine; she began taking classes in Spanish, which eventually turned in to her second major. She delved further into the sciences as a researcher in Prof. Robert Doyle’s laboratory. Over the last three years, she has conducted research on the oral delivery of peptides and proteins. Bernstein, who is also a Remembrance Scholar, an Orenstein Scholar and a member of the Renée Crown University Honors Program, added more depth to her knowledge the last four years with Syracuse University Ambulance, the last year as a field supervisor. Helping to care for people when going on a call; working with other emergency agencies, such as SU’s Department of Public Safety and Rural/Metro Ambulance in Syracuse; and training the new ambulance members made a big impact on Bernstein. “It’s rewarding when you train someone and it clicks with them and they understand what they have to do—and you’ve had an influence on that,” she says. Bernstein wanted to capture the specialness of her experience and that of all graduates in her Commencement speech. In her speech, for which the other University Scholars gave her feedback, she points to how students came together to raise funds to support those affected by the Newtown and Boston tragedies, how the University continues to remember and celebrate the lives of the 35 SU students who were killed in the Pan Am 103 bombing 25 years ago, and how students integrate community engagement—Scholarship in Action—and classroom learning, such as through tutoring community youngsters and building homes through Habitat for Humanity. “There’s so many ways to get involved and people really pride themselves on not only staying involved on this campus, but communities everywhere—that’s what makes us who we are,” she says.